The BoatU.S. Foundation counts on donations to keep our boating programs afloat. One way to make a difference is to donate your boat. We will ensure the donation process - from handling the paperwork to picking up the boat - runs smoothly. In addition, donors can be sure that their donation will go to programs that help keep boating a safe and enjoyable pastime for generations to come. Please consider donating your boat and receive the maximum legal tax deduction. Fill out our free survey and we'll evaluate your potential donation! 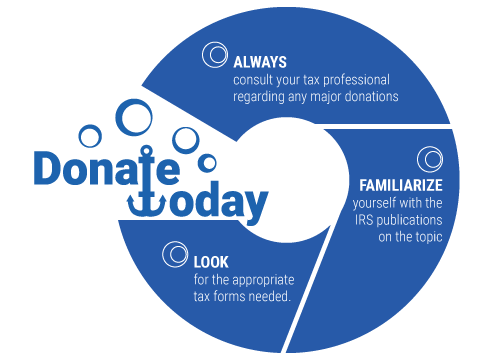 Remember you can deduct contributions to charity only if you itemize deductions on Schedule A of Form 1040 and attach a 1098-C form which you receive from the organization you donate to, with your tax return. Complete your renewal online in 5 easy steps. A Donor's guide to vehicle donation (PDF).